Bharat Electronics Limited, Ghaziabad which is one of the Navratna Company immensely offering the BEL Apprentice Recruitment Notification 2019 for 150 ITI Trade Apprentice posts in order to train them as per the Industrial norms and informing the ITI cadets to just verify the Bharat Electricals Limited Apprentice Notification and apply through apprenticeship.gov.in on or before 22nd April 2019 in Online. Ghaziabad BEL Apprentice Notification 2019: Multiple Opening from the BEL, Uttar Pradesh Branch. One of the Navratna Company BEL Announced the BEL Apprentice Recruitment Notification in its Ghaziabad Branch to provide the intensive training for the ITI Trade Holders for the Trades given on the Advertisement. And it accepting applications from India wide and respective contenders who are India Residents can Enrol their Names for this BEL Apprentice Jobs. Already, multiple Contenders applied and getting ready for the Jobs for qualifying the Written test which is to be organised by the BEL Officials. Most of the Candidates think that if they Get Trained in this particular Central Government Organisation they have bright job offers in future. So, for all those interested Ones must bookmark this Jobschat site to get this type of Jobs openings. Job Hunters who are searching for Uttar Pradesh Sarkari Jobs, BEL Ghaziabad 150 Apprentice Openings is a best opportunity to make their education career fulfil with Training part in BEL reputed organisation in order to settle in Core Government Jobs with high salaries and also helps for their education also. So, all the interested ones can first check the complete Stipulations listed and Trades wise Vacancy gave and act, apply as per the Informed format without any prior mistakes and submit to the BEL Organisation through www.mhrdnats.gov.in only within the due dates and check the Topics that are going to cover in Written Examination to refer them through Previous Question Paper which is updated identically here for Registered candidate effective groundwork in order to select for the www.bel-india.com Apprentice Vacancy. Candidates who completed their Education in 10th Class with ITI Training under NCVT Trades of the Following Streams given on the BEL ITI Apprentice Recruitment Notification 2019 are eligible. And the applicant must possess the maximum age limits of 28 years as on date 30th April 2019 and 05 yrs relaxation for SC/ ST aspirants and 03 years for OBC postulates. There is No Specified fee to be paid by the Applicants for this BEL Apprentice Notification 2019. BEL Ghaziabad Officials will recruit the officials only through the Following Rounds for the 150 BEL ITI Apprentice Vacancy. Qualified Ones will be paid with Stipend as per the Apprenticeship rules. On the Homepage Search for Careers tab and open it and find the BEL Ghaziabad Trade Apprentice Notification 2019. Clearly go through it entirely and can open the BEL ITI Trade Apprentice Application which is along with Notification and Fill it properly and attach the copies of photographs and other eligible documents. Check once all the details you filled and scanned copy must be submitted to in Online. Keep a xerox copy of this Scanned copy to use it final selection rounds. 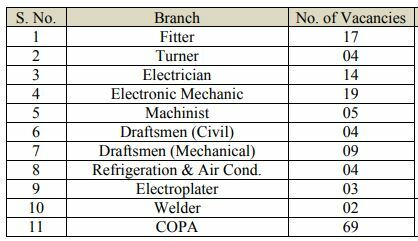 Latest BEL Apprentice Careers, BEL offering the 150 Apprentice For the ITI Qualified Holders in Ghaziabad, UP Branch from India wide and accepting the Scanned copies from the applicants and select them for the one-year Training. For Offering the Training, the BEL Organisation will Conduct a Test/ Interview for the applicants enrolled by sending the Admit Card on the respective Subject to evaluate the Candidates worth and then train the Talented aspirants. And BEL also gives the Stipend to them as per the Indian Apprentice Norms and issue the Certificate who successfully completed the Apprenticeship as per the details mentioned on the Bharat Electronics Limited Apprentice Recruitment Notification 2019.